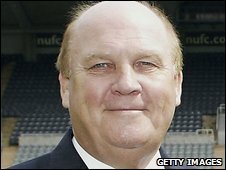 Former Newcastle chairman Freddy Shepherd is heading a consortium that is set to launch a £60m takeover bid for the Magpies, BBC Sport understands. Alan Shearer has been lined up to carry on as manager after Newcastle were relegated to the Championship in May. Owner Mike Ashley was asking for £100m but BBC Sport understands Shepherd's offer is likely to be accepted. Shepherd sold his Newcastle shares to current owner Mike Ashley two years ago as part of a £134m deal for the club. Ashley's total investment in the club is estimated at £244m, which includes paying off debts and buying new players. When Ashley first put the club up for sale last September, he hoped to get about £300m. Shepherd became chairman in 1997 when Sir John Hall and his son Douglas were the major shareholders and negotiated the £15m signing of Shearer. Always a controversial figure, Shepherd was forced out of the club when Ashley bought his controlling interest. Several other groups, including investors from Singapore, Oman and South Africa, have also shown interest in buying the club. The man in charge of the sale, Keith Harris, the chairman of brokers Seymour Pierce, has said he expected a deal to be concluded by the end of June. BBC sports editor Mihir Bose said that the cost of Shearer and his backroom staff would cost the new owner in the region of £3m a year, with the former England striker seeking £2m for himself. The owner will also have to finance the wages of 15 players, each of whom earns about £50,000 a week, said Bose. Meanwhile, Newcastle temporary boss Chris Hughton has revealed that the uncertainty surrounding St James's Park at the moment must not seep on to the training ground. "Everything will be done properly with the group of players that is there, and everything that is going on outside of that has to stay outside of that," said Hughton, who will be assisted by Colin Calderwood. "Whatever the situation will be, when it comes to the first day of pre-season training, the players will go through a correct programme for however long it is until someone takes over. "The most important thing is the players get a good pre-season under their belts. "The most important thing is that the club has to come straight back up," added Hughton.